* The first shot is a burst of cold with juniper berry, pepper, and citrus. It’s a bit strong and bracing, with strong projection for the first 30 minutes. * South African sprint runner Oscar Pistorius is the face of the fragrance. Known as “the fastest man on no legs,” he is a double amputee who runs with artificial limbs. I wonder if the inspiration was to be a sports fragrance with a unique twist. * A fresh mint joins in with the pepper – I guess that would be called peppermint <grin>. * Pure Shot bares little resemblance to A*Men, with none of the coffee, chocolate, caramel or musk that the original is named for. * After about 2 hours, it calms down to a nice woody patchouli that lasts for a good 6 hours. Summary: Pure Shot came as a total surprise for me. When I reach for an A*Men or and A*men flanker, I am expecting deep intense juices that projects. Pure Shot could easily be described as the A*Men sports fragrance as it is refreshing, light, and heats up well with physical activity. I would compare it to Serge Lutens L’eau, a clean laundry fragrance in a line of heavy oriental scents. 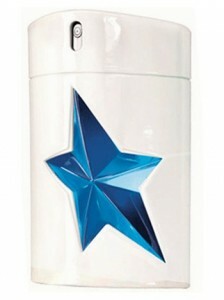 Pure Shot seems like it was made for guys who don’t wear A*men or don’t like heavy scents. With that said, I do like it and it would work as a great summer scent. A*Men Pure Shot is available exclusively at Nordstrom and the Thierry Mugler website. I haven’t tried this and I’m really, really surprised that it isn’t A*Men-ish – without coffee, food or booze. I think you nailed it. It’s an atypical sports fragrance. Thanks.. for the kind words.. it’s worth a sniff. Something completely different from the line. I’ll try to get to it in the next couple of weeks – before it’s gone. But I’ll hope not to like it: I can’t keep buying limited editions just not to miss them. Yeah, it ends up being like H&M – if you see it, you have to buy it now, because it will be gone next week. I don’t think A*Men Pure flankers go that quickly.. but..